Tarzana is widely known as one of the most upscale sections of the San Fernando Valley. It's somewhat less well known as the area once owned by Tarzan-creator Edgar Rice Burroughs. Of course, few people are thinking about that when they are in the need of the outstanding urgent care Tarzana residents hope for. Dr. Michael Farzam of House Call Doctor Los Angeles might not be a legendary pulp hero like Tarzan, but as one the few practicing house call doctors he does offer what many patients regard as a heroic service. Let's face it, finding the right kind of urgent care in Tarzana or anywhere else in the concrete jungle of Southern California area can be a genuine challenge. Being under the weather is stressful enough, but fighting some of the nation's heaviest traffic only to then wait your turn at the kind of crowded walk in clinic Los Angeles residents expect is not necessarily the best thing for what ails you. The good news is that a first rate, board certified M.D. like Dr. Farzam is ready to meet you at your home, hotel room, or office to provide you with the care you need, whenever you need it and just about wherever you are. 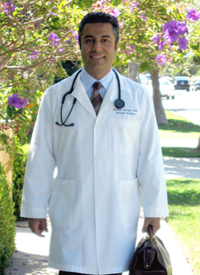 Providing 24/7 service to the entire Los Angeles area, Dr. Farzam is as ready to provide urgent care in Beverly Hills, Santa Monica, Venice, or the South Bay as he is to the San Fernando Valley. There are many good reasons for taking advantage of House Call Doctor Los Angeles, but what may surprise many is how reasonable the rates are, particularly in comparison with what many people are likely to pay at emergency rooms. Moreover, the personalized service Dr. Farzam provides is far above the level you're like to find at a typical walk-in urgent care. Tarzana and San Fernando Valley residents would have a hard doing better. To find out more about the kind of first-rate urgent care Tarzana residents have come to expect from Dr. Michael Farzam, please see our contact page or call 310-849-7991.